Fayose impounds one of the cows grazing along Ado-Afao Road. 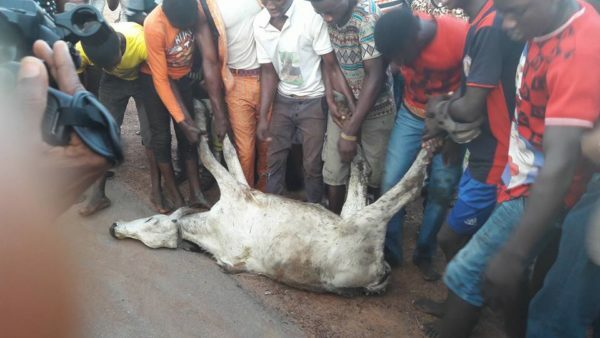 This is a funny story indeed.The Ekiti State Governor, Mr. Ayodele Fayose, has impounded one of the cows that were grazing along Ado-Afao Road. youths to impound the cow. He said as soon as the two herdsmen monitoring the cows sighted the governor, they ran into the bush, while some of the youths chased the cows and got one of them. He said, “Governor Fayose was going to Ikole Ekiti when he came across herdsmen along Afao Ekiti Road in Ado Ekiti. Olayinka disclosed that the Ekiti grazing enforcement marshalls would start work in a few days. Fayose had on August 29 signed a law to regulate the grazing of cattle and other animals in Ekiti. The law provides that grazing activities must be from 7am to 6pm on a daily basis. According to the Ekiti State House of Assembly, any herdsman caught with firearms and any weapon will be charged with terrorism. The law also provides that any farm produce destroyed by the activities of the herdsman shall be estimated by an agricultural officers and the estimate should be borne by any arrested herdsman.